Welcome to our Game In Progress review of Mass Effect: Andromeda. Gameological Editor Matt Gerardi will be playing through this latest entry in BioWare’s beloved space-opera series and occasionally reporting back with his thoughts on how it’s shaping up. This second entry covers his first 45 hours with the game, to a point where he’s completed its loyalty missions, settled all of Heleus’ viable planets, and led an assault on a Kett flagship. Matt is playing as a woman and, for simplicity’s sake, will be referring to Ryder as she/her throughout. As always, we invite you to play and comment along as he path-finds his way through the Heleus Cluster. I’ve poured another 20 hours into Mass Effect: Andromeda since last checking in and not much has changed. I’m still avoiding the majority of side-quests, only breaking from my vow to take no tasks to tackle the most promising chores that come my way, and I’m still enjoying the game only in fits and starts. Most of that time was spent settling all the viable planets in the Heleus Cluster through my mastery of space sudoku and willingness to mindlessly run errands (read: shoot stuff) for any self-important scumbag who asks. In my bloodthirsty fugue state, I tamed the sulfur-ridden mountains of Kadara and conquered the deserts of Elaaden, spending hours chasing map markers all to further my displaced Milky Way brethren’s colonization efforts. But every once in a while I’d take a break from the drudgery of planet-settling and encounter some scene or mission that completely snapped me from my idle content-gobbling trance. When Andromeda settles down and deigns to give you a simple self-contained story, it’s capable of some great things. For starters, it revisits one of the facets that made Mass Effect 2 so effective: loyalty missions. In that game, you were tasked with assembling a crack team of outcasts whose trust you’d slowly win over. Each ally’s arc culminated in a mission tailored to their personal story, and afterward, they’d be your new best bud. Andromeda’s loyalty missions have been, by a country light-year, the best thing about it. Vetra’s has you driving around a moon in low gravity and saving the one thing in the galaxy that matters to her most. Peebee’s is an Indiana Jones-esque romp that pits you against her treasure-hunting ex-girlfriend in a race for an alien relic. Liam’s is a lengthy firefight through a tumbling cargo ship, full of action-movie bravado from both the villain and Ryder as you sort out yet another of your most insufferable crewmate’s messes. They’re reflections of your friends’ lives and personalities, tightly told stories with flashes of charisma and creative character-building that the rest of the game hasn’t even come close to mustering. And the heaviest of the six loyalty missions, that of your Angaran buddy Jaal, delves into some of the game’s best thematic territory. Having already been betrayed and subsequently menaced by an alien force, the Angara, Heleus’ only native sentient species, are understandably leery of Ryder and her people. While saving an important Angaran from the Kett was enough to win over most of their leaders and forge an allegiance at the highest political levels, many Angaran are still afraid of you. The game displays that fear and intolerance on many levels, from everyday folks writing your leaders angry emails to a militaristic splinter group attacking your settlers. Once the Angara are involved, Ryder’s mission is no longer just an exploratory one. It becomes an exercise in intergalactic diplomacy, as well, with Ryder and her crew dealing with a surprising amount of political maneuvering and dramatic turns as this fragile alliance develops. 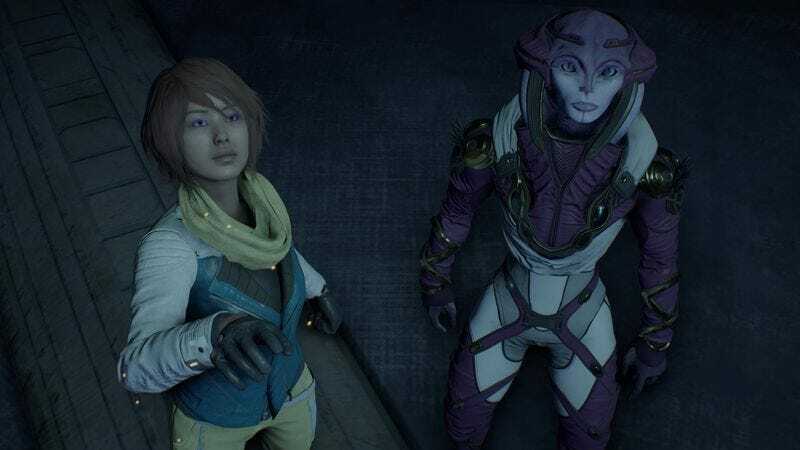 If Andromeda’s loyalty missions represent Mass Effect at its space-swashbuckling best, it’s the more intimate threads like these that tap the series’ capability for affecting small-scale storytelling. The game’s premise really is a fascinating one, and Andromeda cleverly explores some of the personal, logistical problems that would come up when you freeze thousands of people alive, ship them to a new galaxy, and deal with the nightmare of stabilizing and populating the place. Unlike the dozens of hours of shoot-’em-up, scan-the-thing fluff that make up the rest of the game, these bits have weight and speak to the human (and Salarian and Turian and Asari and Krogan) conflicts at the center of this whole endeavor. Even more intriguing is the somewhat hidden story about the Initiative’s beginnings and your father’s reasons for joining up. Its implications are so incendiary that I was shocked to know the game would allow you to blindly keep going without so much as hinting at what’s going on. The problem, of course, is that these worthwhile moments and storylines are only a fraction of Andromeda. If the whole game were as focused and colorful as those loyalty missions or as thoughtful as that Angaran political drama, it could’ve been another great Mass Effect outing. Instead, it’s a bloated, buggy mess that has you fast-traveling around a half-dozen open worlds in search of the tasty nuggets among its ocean of flavorless video game slop. When you finally find them, it’s like you’re playing a completely different game, one with a sense of humor and stakes and urgency. I just wish I had sunk 45 hours into that game instead of this one.